Spasojevic, Labraña, Poluta also score victories. 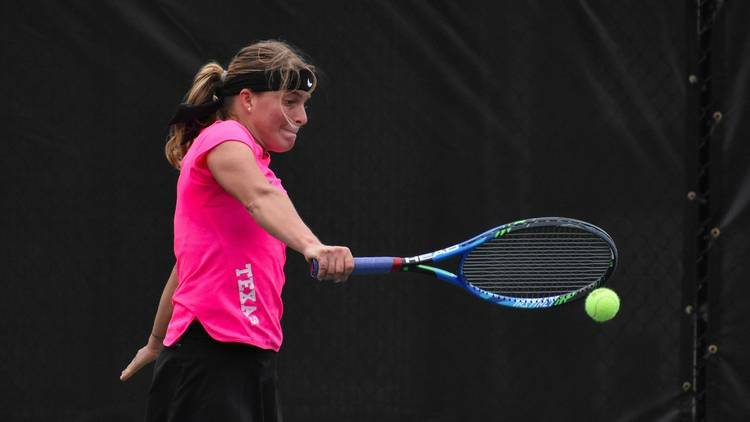 Junior Bianca Turati beat Tamara Arnold of Switzerland 6-2, 6-3 Sunday in the first round of singles qualifying at the ITF pro circuit 80k event in Tyler. Turati advanced to the second round of qualifying Monday. Also Sunday, UT posted a perfect 3-0 mark in singles play at the River Oaks Country Club Fall College Invitational in Houston. Freshman Tijana Spasojevic had a 6-2, 6-7 (7-5), 6-4 win over No. 105 Linda Huang of Rice, sophomore Fernanda Labraña topped Rice’s Victoria Smirnova 3-6, 6-3, 6-4, and senior Katie Poluta took a 6-1, 5-7, 7-5 win over Vivienne Kulicke of SMU.